With all this super cold weather a nice warm Hot Chocolate made with TruMoo Chocolate Marshmallow is the perfect treat after playing in the snow. You can also enter to win a $500 Target Gift card to purchase all the TruMoo you wish. TruMoo is delighting chocolate lovers everywhere with a special February flavor. "TruMoo Chocolate Marshmallow." My kids and I picked some up from our local target just to give it a try. We choose to try ours hot after a long day of playing in the snow as a treat to warm up. My kids loved how easy it was to prepare, I even let them help. Just pour it into a microwavable cup and for us we just hit the beverage button. My kids loved the flavor and even asked for a second cup. Kids love to dip things into their drinks so, my youngest decided to dip her graham crackers in it and make her own s'more. The idea caught on and my other daughter decided to dip in a peppermint candy cane. They enjoyed all their new drink and food creations. I think I'll try as a milkshake base after I pick up more TruMoo Chocolate Marshmallow from the store. TruMoo Chocolate Marshmallow milk is made with fresh white milk sourced from regional dairies around the country with pure cocoa and just enough natural sugar to make it taste great. It is both Nutritious and Delicious! TruMoo Milk also contains no artificial growth hormones and no high fructose corn syrup. 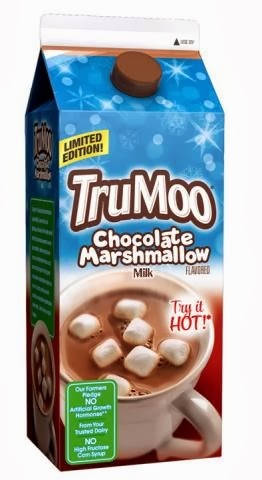 Enjoy TruMoo Chocolate Marshmallow hot or cold! Try it as an ingredient in your favorite mocktail. Enjoy it hot and you have yourself a s'more by dipping in your favorite graham cracker! It's available in the dairy section at grocery stores nationwide through the month of February. Check out TruMoo on their webpage, Facebook, Twitter. Check your local stores for Availability. Don't forget to enter the Giveaway below to win a $500 Target Gift card sponsored by TruMoo.